That ugly holiday sweater in the back of your closet could be your ticket to a free flight on Southwest Airlines. 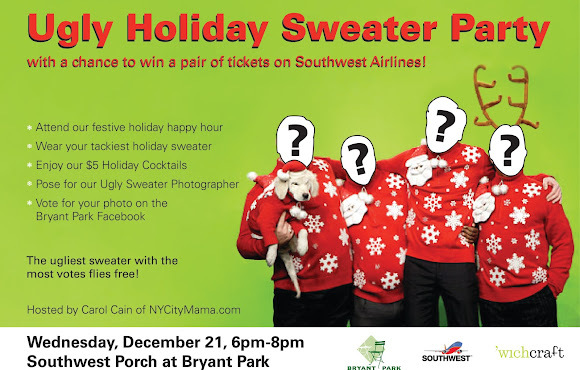 Come to the Southwest Porch on Wednesday in your tackiest knitwear for our Holiday Happy Hour. Enjoy festive 'wichcraft holiday cocktails, and have your picture taken by our Ugly Sweater Photographer. We'll post your photos on Facebook, and open the contest for voting over the next week. Get your friends and family involved, because the ugly sweater with the most votes will win a pair of Southwest Airline tickets. Now, go dust off that sweater, or run out and buy one... the payoff for being properly outfitted at this party will be well worth it! Many thanks to our host NY City Mama who will be out in her ugly holiday finery to celebrate with us. This is great and perfect timing too. If you take a photo of yourself in that ugly sweater, post it on the Visiting Nurse Service of New York's Facebook page (https://www.facebook.com/vnsny) and you can win $100! Details at http://bit.ly/w01u8a. Good luck and I can't wait to see the pictures! Wish I could be there!! So sad to be away from my beloved NYC during Christmas. But what a fun and festive event for NYC, in my favorite park no less.